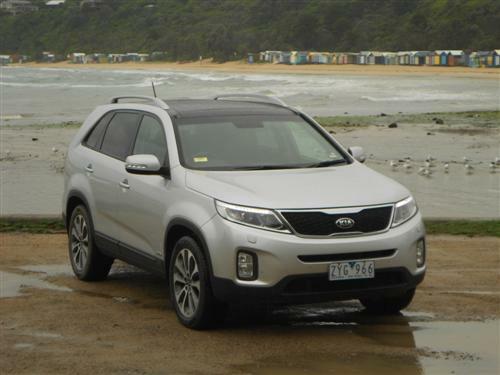 Kia competes in the lucrative SUV segments of Australia's expansive car market with two quite worthy entrants - Sportage and Sorento. Each model receives regular updates to retain a high degree of competitiveness. 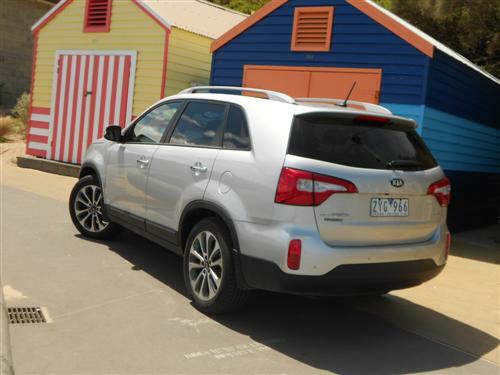 The larger of Kia's two SUVs is the attractively styled Sorento, which has been around since 2009 in its second generation format. 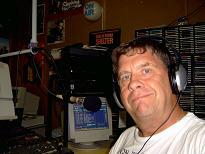 Regular updates keep it fresh. Various mechanical lay-outs are available - 2WD and 4WD, manual and automatic, and petrol and diesel engine choices. 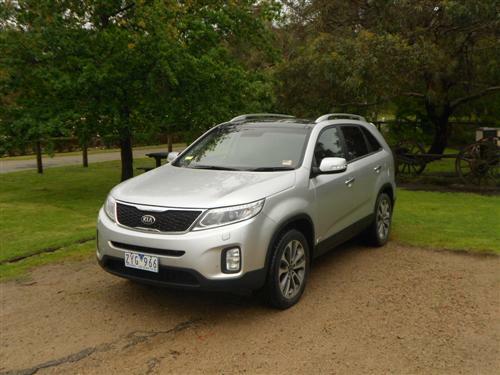 Our test car, for this drive experience around Melbourne's south-eastern bayside area, was the top-of-the-line Sorento - the Platinum - coloured Bright Silver Metallic. The Platinum comes standard with a diesel engine, automatic transmission, four-wheel drive, seven seats, sunroof and a navigation system. The Sorento Platinum is priced at $50,790*. Premium paint is optional at $595*. Hence our test car has a price of $51,385*. This is a competitive price for a very well equipped medium-to-largish SUV. The Sorento is available in 3 trim levels - Si, SLi and Platinum. The Si comes as a 2WD petrol auto (from $38,490*, 4WD diesel manual from $39,990* or 4WD diesel auto from $41,990*. The mid-spec SLi is available with 2WD petrol auto from $40,990* and a 4WD diesel auto from $44,490*. The top-of-the-line Platinum comes only as a 4WD diesel automatic. The Sorento is quite a reasonable drive. It is a family size car that offers a good ride, with the traditional driving dynamics of a larger SUV - which means not as nimble as a similar sized sedan. Performance from the turbo-diesel is more than adequate and this, in fact, makes the Sorento quite a decent vehicle. 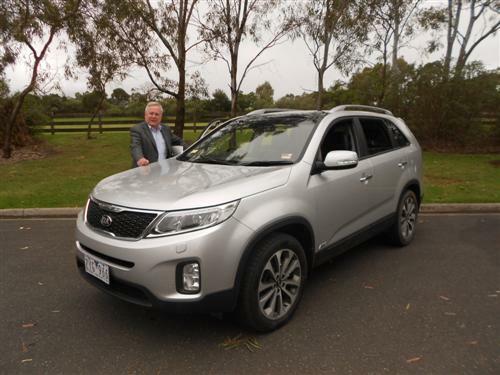 On road qualities were pleasing and the Sorento isn't tiring on the driver. I managed to be out during some heavy rain and came to the conclusion that whilst there is a place for 2WD SUVs, the 4WD provides more peace of mind during such inclement conditions. The four-wheel drive is sure-footed in such circumstances and, as such, makes a lot of sense for larger vehicles. 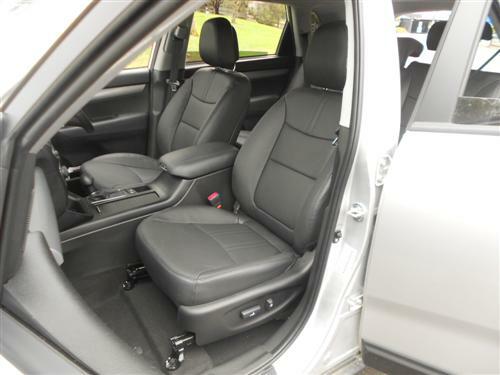 Those who travel long distances or face congested commuting in their car will be keen to learn that the Sorento comes with 5 cup holders and four bottle holders. 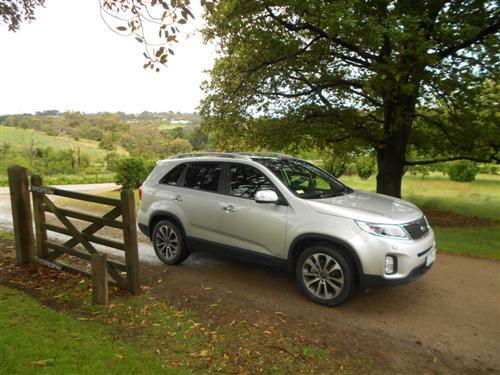 We covered 365 kilometres, during our time with the Sorento - on suburban streets and highways in south-east Melbourne together with a drive around the populated areas of the northern sector of the Mornington Peninsula. Thus we managed to cover fairly typical types of driving that many Sorento drivers would encounter. The cruise control is user-friendly. The Platinum has a great feature, which is slowly gaining acceptance from manufacturers, and that is the "climate control" for the front seats. I like it a lot, especially on a hot day when you're covering some distance. 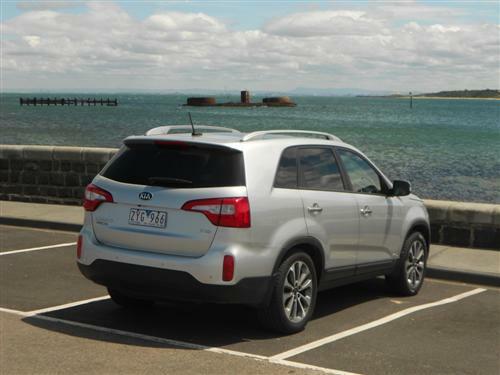 The Sorento Platinum offers a pleasing environment for motorists. 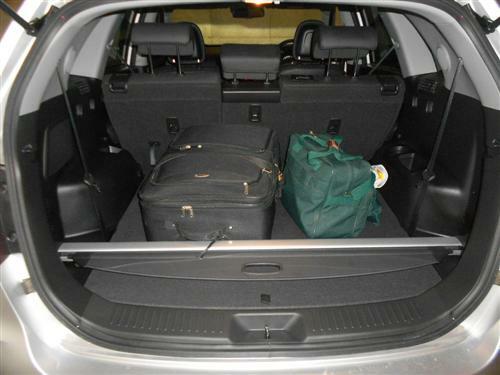 Although a seven-seater, we configured the Sorento as a five-seater for the duration of our experience. It needs to be pointed out that luggage space is quite minimal when the third row of seats is upright. 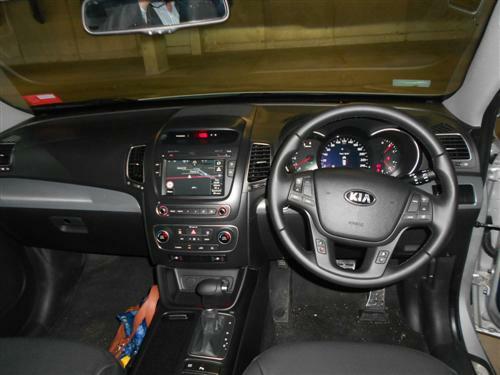 All controls are intuitive, a typical attraction of Kia design. A neat feature is the electric folding external mirrors. This is becoming increasing important as more and more people move into apartment blocks with property developer inspired and local council authorised narrow parking spaces. The test car's diesel engine was a 2.2-litre, in-line, four-cylinder unit, developing 145kW of power at 3,800 rpm and a credible 436Nm of torque between 1,800 and 2,500 rpm. Sorento Platinum comes with four-wheel drive as standard, although we didn't take it off-road. The automatic transmission is a six-speed unit, which was well matched for use in the Sorento. Sixth gear is the only overdrive ratio with this particular gearbox. Four-wheel disc brakes are fitted, the front discs being ventilated. Electric power steering is standard equipment. Sorento Platinum comes with five attractive 19" alloy wheels as standard. In earning a five-star crash worthiness rating by ANCAP, the Sorento diesel/automatic scored 33.21 points (out of 37). Electronic Stability Control (ESC) with Traction Control System (TCS); Anti-lock Braking System (ABS) with Electronic Brakeforce Distribution (EBD) and Brake Assist (BA); Vehicle Stability Management; Hill-start Assist; 6 airbags (driver, front passenger, front side and curtain); 3 x child restraint anchorage points; and much more. We appreciate the fact that all Kia Sorento models are fitted with a reverse camera together with front and rear parking sensors. On the 'combined cycle', fuel consumption for the Kia Sorento diesel/automatic is rated at 7.3 litres/100 kilometres. The urban consumption is rated at 9.7 litres/100 kms. The onboard trip computer indicated our consumption was 10 litres per 100 kilometres. We were happy with that as our driving was almost all urban traffic conditions, sometimes in heavily congested circumstances. The fuel tank capacity is 64 litres. CO2 emissions rating is 192 grammes/kilometre on the 'combined cycle' for the diesel automatic Sorento. Increasing important for many buyers is the inclusion of modern day essential 'gadgets'. Sorento comes with AUX/USB input with iPod compatibility, Bluetooth functionality, MP3 compatible CD player with AM/FM tuner and a 7" screen in the Platinum. Steering wheel controls are easy to operate. 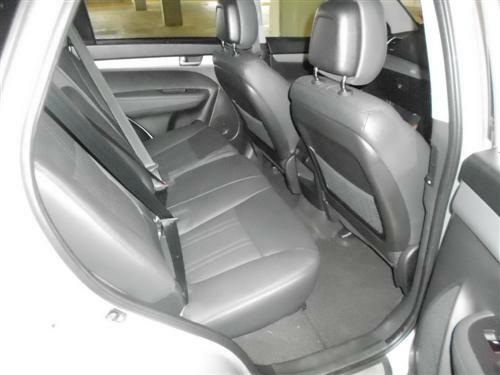 Boot capacity: 1,047 litres with third row of seats folded down, 258 litres with the third row of seats upright. With appropriate tow equipment, the Kia Sorento (4WD automatic) will tow up to 2,000kg (braked trailer). An excellent warranty is provided by Kia Motors. It is a five year/unlimited kilometre warranty for private use vehicles, some business and government use vehicles (certain business and government vehicle uses have a 5 year/130,000 kilometre warranty). Conditions apply, as with all warranties. The five year warranty is transferable to a subsequent owner upon the sale of a Kia Sorento. Roadside assistance is included for one year, with conditions, and can be renewed for a further year if a Kia dealer undertakes the scheduled servicing as required. A free service at three months is included. Capped price servicing is a Kia strong point. The Kia Sorento fits into market quite nicely. 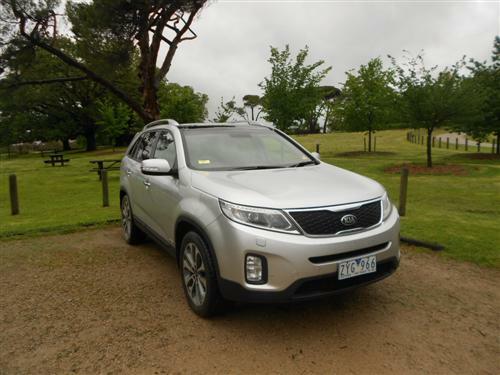 It isn't too big and it isn't too small, although I do see the Sorento as a spacious five-seater rather than a compromised seven-seater. With a good feel on the road, backed up by superb after sales features, the Kia Sorento 4WD diesel automatic is a fulfilling drive that demonstrates an SUV can be a satisfying vehicle for everyday use as well as a neat getaway car for weekends.